Gastrointestinal (GI) perforation may occur at any anatomical location from the upper oesophagus to the anorectal junction. It should be a diagnosis considered in all patients with an acute abdomen. In GI perforation, the potential to cause peritonitis and a responding inflammatory cascade are constant factors. An untreated patient can progress rapidly into septic shock, multi organ dysfunction, and death, hence is an important differential to consider. In this article, we shall look at the causes, clinical features, and management of gastrointestinal perforation. *GI malignancies are also capable of local invasion through the bowel wall leading to perforation. The presentation is dictated mostly by the anatomical location of the perforation. Any intra-peritoneal gastrointestinal rupture presents with abdominal pain, typically crescendo in nature, beginning as a generalised pain focused to the affected region, before spreading as the organ perforates. There is usually an accompanying generalised abdominal tenderness, worse on movement (known as the rigid abdomen). On examination, the abdomen will be distended and peritonitic. A palpable mass may be present, depending on the underlying cause (e.g. appendiceal mass or malignancy). A retroperitoneal perforation can be insidious in onset. The presentation can vary and patients may complain of right shoulder tip pain referred from diaphragm irritation, back pain or right iliac fossa pain (right paracolic phenomenon*) representing retroperitoneal duodenal ulcer, or pelvic or left lower quadrant pain suggesting diverticulitis. Importantly, there may only be minimal or focal tenderness on palpation, with an otherwise normal examination. *Gastric content settles in the right paracolic gutter due to gravity, and may mimic appendicitis. Any thoracic region perforation will present with pain, ranging from chest pain or neck pain to pain radiating to the back or pain on inspiration. There may be associated vomiting (however this may also be preceding if an oesophageal rupture) and respiratory symptoms. On examination, auscultation and percussion may reveal signs of a pleural effusion, with the potential for palpable crepitus. The list of potential differentials is vast. Important differentials to consider are acute pancreatitis, myocardial infarction, tubo-ovarian pathology, or a ruptured aortic aneurysm. Any patient with an acute abdomen will require routine baseline blood tests, including G&S. Raised WCC and CRP are common features, dependent on timing and degree of contamination, and amylase is often mildly elevated in perforation (although non-specific). A urinalysis should also be routinely performed to exclude both renal and tubo-ovarian pathology. Imaging is vital to confirm the suspected diagnosis (by demonstrating air outside the gastrointestinal tract); whilst radiographs alone can dictate a visit to the operating theatre, further imaging is usually warranted. Rigler’s sign – both sides of the bowel wall can be seen, due to free intra-abdominal air acting as an additional contrast. Psoas sign – loss of the sharp delineation of the psoas muscle border, secondary to fluid in the retroperitoneum. The gold standard for diagnosis of any perforation is with a CT scan, confirming any free air presence and suggesting a location of the perforation (as well as a possible underlying cause). A contrast swallow is also useful for confirming any suspected oesophageal perforation. Figure 2 – Radiographic evidence of pnuemoperitoneum a) Free air under the diaphragm; and b) Rigler’s sign. The management of any suspected GI perforation warrants an early assessment and resuscitation as necessary. Broad spectrum antibiotics should be started early, especially in patients deemed to need surgery for contamination. Patients should be placed nil by mouth and an nasogastric tube considered. Provide adequate IV fluid support and analgesia. Following this standard initial approach, management becomes highly individualised, taking into account the site of perforation and patient factors. 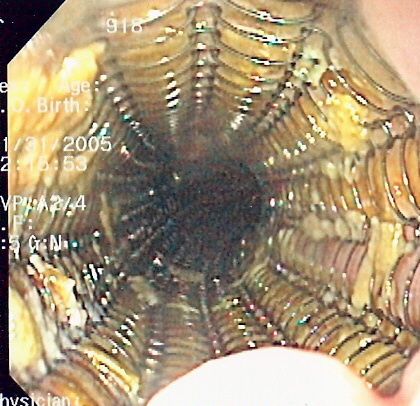 Figure 3 – Oesophageal stents can be used as part of the conservative treatment of perforation. Any patient who is systemically unwell with confirmed or suspected perforation (or who has failed conservative management) should be rapidly assessed for theatre. The most important and severe complications of a GI perforation are infection (peritonitis and sepsis) and haemorrhage, with incidence depending on the site involved. The surgical technique employed varies depending on the pathology and the anatomical location involved. The oesophagus can be accessed via neck incision, thoracotomy, or upper abdominal incision, with primary repair of small defects performed where possible. Defects not amenable to repair may require drainage and alternative feeding in form of gastrostomy or jejunostomy. Any stomach or duodenum perforation can be accessed typically via an upper midline incision (but can be done laparoscopically). 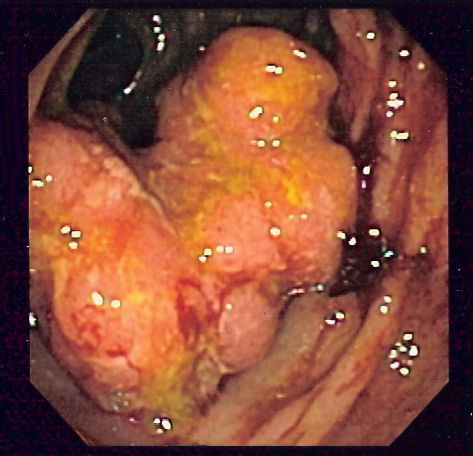 A perforated peptic ulcer is often the most common cause found, whereby a patch of omentum (Graham Patch) is usually sufficient to close an ulcer which would otherwise be difficult to oversew due to tissue inflammation. Small bowel perforations can be accessed via midline laparotomy. Small perforations can be oversewn if the bowel is viable, yet any doubt about condition of bowel should lead to resection and primary anastomosis +- stoma formation. Large bowel perforations can also be accessed via midline laparotomy. Once any underlying cause is managed, a primary anastomosis is preferred, with or without covering/divergent stoma in proximal bowel. The formation of an end stoma and distal stump with intention to rejoin later is also an option, such as a Hartmanns’ procedure. The most important aspect of any surgery for perforation is the intraoperative washout. This should be copious to reduce the bacterial load and further administration of post-operative antibiotics is imperative. Shoulder tip pain following a peritoneal perforation suggests irritation of where? Which is not radiographic evidence of pnuemoperitoneum?